I’m not sure if it is something I’ve been eating or the stress over the economy, but my dreams have been strange. Two nights ago, Jess and I were neighbors of the Obamas. In my dream, I was feeling very secure having all of the secret service next door. 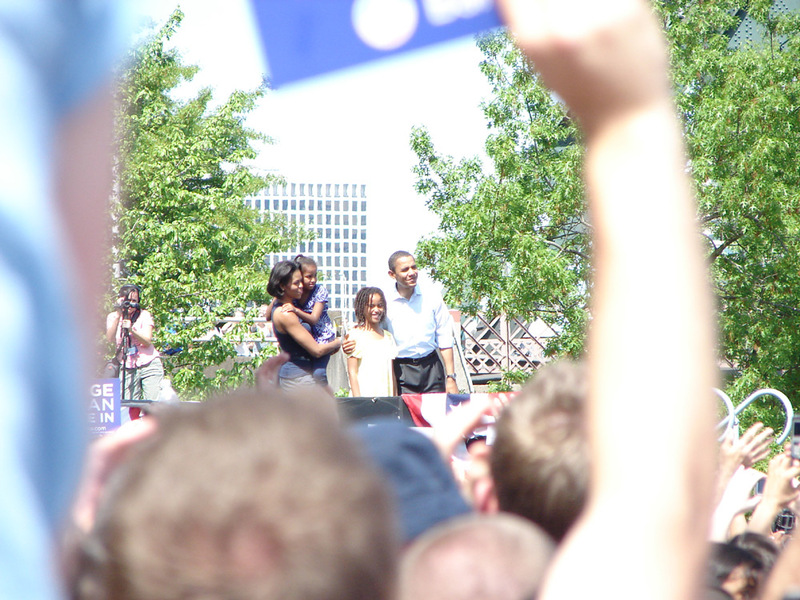 The thing about living next to the Obamas was that not only were there many Obamas, but any time we left the house or returned to it, they came out to greet us. That was the status quo for the dream until i noticed that the president had a huge growth on the back of his head. For some reason, I kept on thinking it was a brain slug. Tonight’s dreams weren’t so congruent. First, I was helping construct Transformer (more than meets the eye) in a giant lab. Then, I guess I became a transformer, but nothing cool like a jet or a tank. I was just a metallic cube. As a Transformer (more than meets the eye), my transforming compatriots and I were having a very frank and heated discussion on the words to use to initiate one’s transformation. We were about to agree on my suggestion of “Energize!” when all of the other Transformers (more than meets the eye) suddenly took of flying and driving out the door. Me, in my cubeness, could only watch… because cubes aren’t meant to move, apparently. After being ditched in my own dream, it suddenly switched over to me being at a party, no longer a cube nor metallic. I was sitting there playing a guitar, effectively going through every Nirvana song ever written. All of a sudden a woman came up, grabbed the guitar by the neck and yanked it away from me. Had she been John Belushi, she would have smashed it against the wall and then apologize, but she just walked off with it. I have always hated watching early results of an election, they always start off skewed. When I watched Kerry/Gore, Kerry would start off with a lead in a state and then it would shift. Last night was the opposite, thankfully. Jess and I went over to the house of one of our friends to watch the results and have some good food (of both I did plenty). The East Coast results were coming in as planned but when I started to be reassured was when Ohio turned blue. This was reinforced by Pratt’s text message saying that with the 207 electoral votes that Obama had, when the West Coast closes it is over. And boy-howdy, was it over. I was surprised how quickly the networks called the election for Obama. I would have thought that they would string it out some more, lead us on a bit to boost up their ratings and their time to air ads. I was wrong. It wasn’t even a minute into eight o’clock that they had put the check mark onto Obama’s picture. Wow. After a round of campaign and fireworks, Jess and I went home. While she got ready for bed I listened to McCain’s concession speech and then Obama’s victory speech. I thought John McCain was humble and honorable in his speech, even to the point where he was telling his supporters to stop booing at the mention of Obama’s name. (Thank goodness they didn’t let Palin speak, like she wanted to.) The thought that got me was that if McCain had run a campaign based on principles like that, I think it would have been a much closer race. Yet, he took the Roveian path of character assassination, mud-slinging, and avoidance of issues, which I think doomed his push for the White House. Honestly (and even though I may take some grief for saying so), I don’t believe that the McCain that ran this campaign was the same McCain that ran eight years ago. The person who I saw running again Bush had more Maverick leanings, was resolute on issues and ran a positive campaign even in the face of the outrageous and horrible things that were said about him. But McCain sold out, he gave up what he appeared to be eight years ago for something that he thought the Republican base wanted… and he might have been right. However, that’s not what the country wanted. As cliche as it has become, the country did want change, almost to the point of a blood lust for change. After the wrecking ball effect of this current administration, how could most people be happy with where we have ended up? For me, this has been a remarkable experience. Not only did I get to vote someone through the primary and then into the election (sorry Gore; sorry Kerry, I didn’t vote for you in the Primaries), but to see them win the presidency was astounding. This all goes back to when I was a kid. I remember sitting in the kitchen watching Clinton win, but even more powerful, I remember being seven and my mom taking me to see Dukakis speak in Portland. I remember her trying to hold me up so I could see but she could only do it for so long, a Dukakis supporter lifted me on to his shoulders. As well, I have an equally distinct memory of the Bush Sr. supporter who was behind us, smoking his cigarette with anti-Dukakis sign, yelling out during the speech. 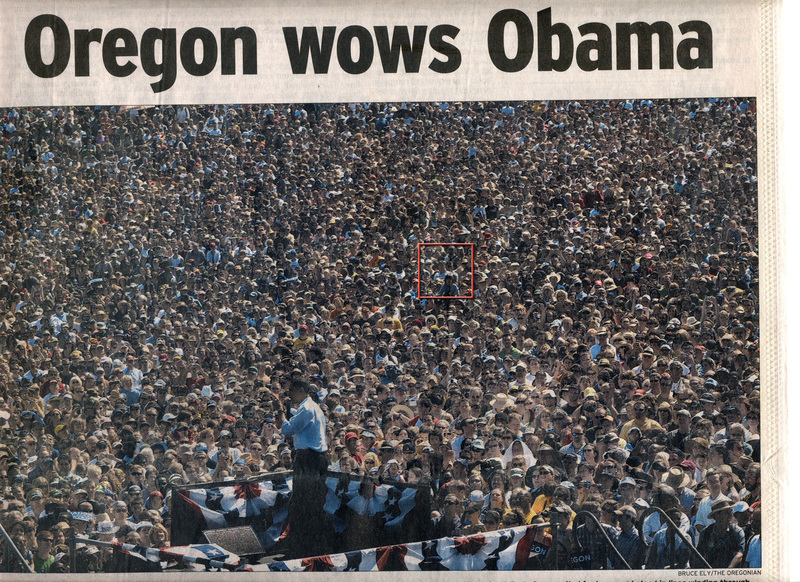 It came full circle when I took my mom to the Obama rally on the Waterfront in Portland. To be a part of the movement, that energy… it is nice to see a dividend. 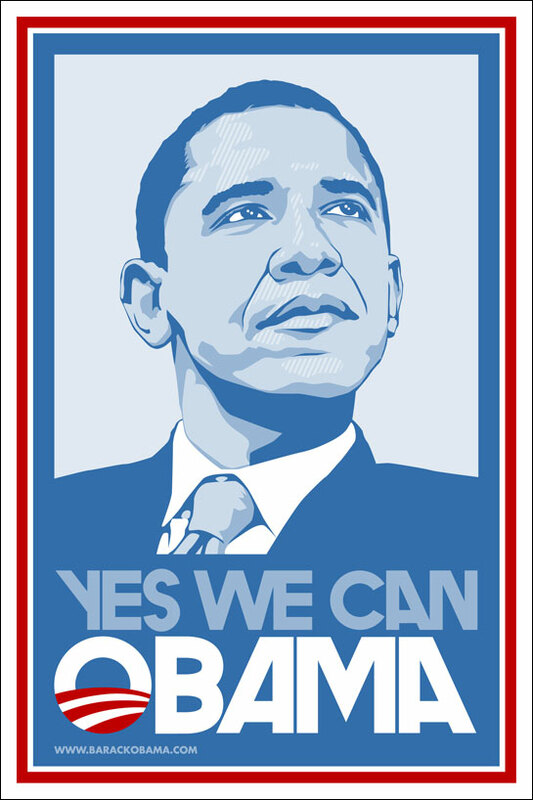 For me, Obama and his campaign has felt different than any of the others. Never before have I felt so enthusiastic for a candidate. As well, I have never been motivated to donate to a candidate, let alone three times. I hope that Obama can hold up to my feelings and the apparent feelings of those who voted for him. There is a lot of expectation for the new president and there are a lot of hardships awaiting his swearing in… a lot of things to correct. I hope that President Obama makes me proud for my vote and disproves all of the slanderous claims he’s had to face, and I hope he continues to do so with class. I also hope that he survives his stint as President. I have a firm belief that there are lot of racist wackos and nuts out there who would fondly talk of assassination. The numbers that scare me too, it only takes one of those wackos. And this plays into my theory that Obama seems like another Kennedy (yes, I realize I wasn’t around when Kennedy was) in our midst. His ideas, his way of speaking maybe this could be a Kennedy for my generation… hopefully without the shortened life and womanizing. Even his wife, strong, well education, holds herself well seems like another Jackie Kennedy. This is a pivotal point in our history, I’m excited to be firmly seated in front for the view. What does it say to our nation and to the world that we as a nation can move past our horrid, intolerant, and bloody racial past. Maybe we can reestablish good standing within the world, it will take time and effort but it could happen. I hope that we have a movement of young people stirred to action for their country and their world, even if it is for assistance with college tuition, they will go out and work for the nation, doing positive and worthwhile actions. Maybe we can move on past the harm and the mistrust between the differing cultures of people that live here. Maybe I am naive; maybe I’ve been swept up and this is just yet another politician who will turn out to be another form of degenerate human leech to bleed the nation dry for his own political and financial gain. I sure hope this isn’t the case and I don’t feel that it is… but still, feelings are easily wrong. I have hope, I pray it materializes quickly. We’ll see. ps. Thank you for those of you Oregon voters who voted down both Education based Sizemore ballot measures. I can’t tell you how scary the Merit pay measure was. How would that have looked for me, as a special education teacher with students who have a documented disability, who have shown to not do well in relation to their peers… how would I have been handled. Thanks again.